Diced apples and cranberries are baked together with a delicious crunchy oat topping in this Cranberry Apple Crisp, the perfect fall dessert. Years ago before I had my daughter when I worked as a full-time graphic designer for a newspaper, there was a woman that I worked with, Diane, who gave me a recipe for one of the most delicious apple crisps I have ever eaten! We used to have a holiday potluck each year and that was the first time I ever tried this recipe. I feel immediately in love with it and requested the recipe so I could make it for my family, it was a huge success with them as well. I have since moved several times and lost the original recipe – I hate it when that happens! Last week we returned from a trip to the mountains of NC and with me I brought a peck of apples. I decided to try to recreate the long, lost recipe so I could enjoy a few of my freshly picked apples. If you are even in Waynesville, NC I recommend a stop at Barber Farms. It is adorable and they sell a variety of vegetables along with their apples and they even have a little bakery there where they sell a selection of tasty little treats; apple cider doughnuts, apple fritters, apple turn overs, apple cake, cookies and cider. Okay that’s the end of my plug for Barber Farms, now on to the recipe. Fresh apples, tart cranberries and a lightly sweet, crunchy topping make this crisp a real hit + it’s vegan. Try it with a scoop of vanilla ice cream, a dollop of fresh whipped cream or enjoy it all by itself, happy baking! Preheat your oven to 375º F and prepare 2 small individual baking dishes with cooking spray. In a small bowl add the cranberries and apple juice, let sit 15 minutes. Toss the apples and cranberry mixture with the lemon juice, divide evenly between the baking dishes and sprinkle with cinnamon. In a small bowl stir together the oats, brown sugar, salt and coconut oil. 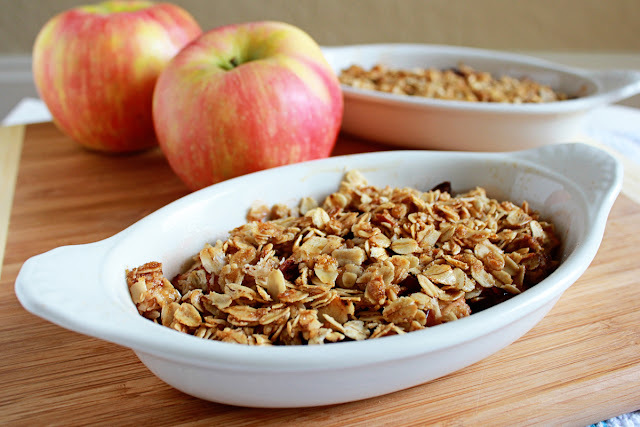 Spread the oat topping over the apples and bake for 17-20 minutes until golden and bubbling. Remove carefully from the oven, cool 10 minutes and serve warm. Visiting from Melt in Your Mouth Monday – this looks delicious! Love the fall season, and all the delicious foods that go with it. That’s a winner in my eyes. I hate it when you lose the original recipe too, but this looks like a suitable contender as it’s replacement, yum! Oh, yummy! I love fall for cranberries and apples! Your apple farms sounds like the cutest place to pick apples! Even though you lost the recipe, I think your recreation looks delicious!!! I know you got featured on The Thriftiness Miss tonight also, but I had to include this recipe on my Weekend Wonders Roundup as well! It looks SO yummy!! !